The Liberal Chamber of Commerce celebrated the 2018 Duck Festival in Light Park on Saturday. There was food, fun and festivities all day long culminating with the “Duck Race” at 2:00pm. Activities throughout the day included vendors and non-profit organization booths, bouncy houses, barrel train rides, trike races, Seward County United Way Chili, Soup Cook Off, Ducky Downs, Chuck a Duck, Duck Splat, and many other activities . 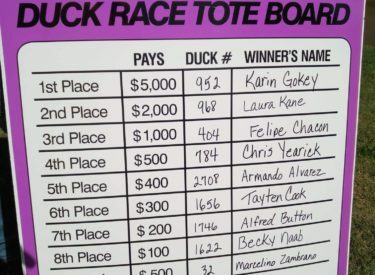 Winners in the Duck Race, the top eight and the “Hard Luck Duck” were: Karin Gokey in 1st winning $5000, Laura Kane 2nd, $2000, Felipe Chacon 3rd and $1000, Chris Yearick, 4th,$500, Armando Alvarez ,5th $400, Taten Cook, 6th, $300, Alfred Button 7th $200, and Becky Naab in 8th for $100. The Lucky Duck picked belonged to Marcelino Zambrano and was good for $500. In the Chili, and Soup, Competition Sponsored By the Seward County United Way, Jandi Head took 1st Place in the Chili Competition. On the soup side, Mike Brack took 1st. Peoples Choice winner overall was The Rotary Club. The team of Aaron Luman and Jared Fox won the Firefighter Water Barrel Challenge and the Recreation team won the Corporate Trike Race.